Wang, X., et al. J. Biol. Chem. 285(7):4951-4963 (2010). Xu, C., et al. J. Biol. Chem. 281(23):15900-15908 (2006). Xu, C., et al. J. Biomol. NMR 31(2):179-180 (2005). Mungall, A.J., et al. Nature 425(6960):805-811 (2003). Clark, H.F., et al. Genome Res. 13(10):2265-2270 (2003). PPIL1 monoclonal antibody (M01), clone 2C2 Western Blot analysis of PPIL1 expression in HeLa ( Cat # L013V1 ). 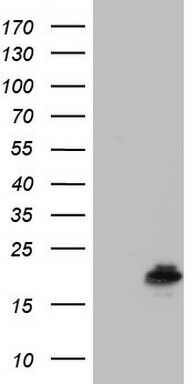 Western Blot analysis of PPIL1 expression in transfected 293T cell line by PPIL1 monoclonal antibody (M01), clone 2C2.Lane 1: PPIL1 transfected lysate(18.2 KDa).Lane 2: Non-transfected lysate. 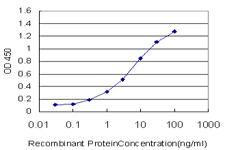 Detection limit for recombinant GST tagged PPIL1 is approximately 0.1ng/ml as a capture antibody. 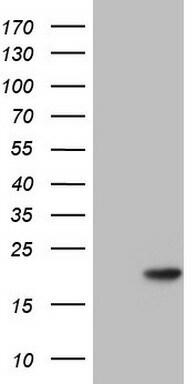 PPIL1 polyclonal antibody (A01), Lot # 060524JCS1 Western Blot analysis of PPIL1 expression in K-562 ( Cat # L009V1 ). 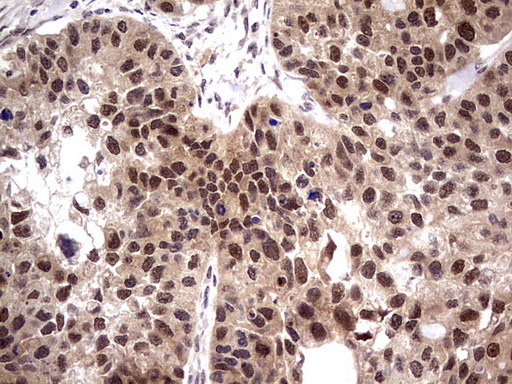 PPIL1 polyclonal antibody (A01), Lot # 060524JCS1. Western Blot analysis of PPIL1 expression in NIH/3T3. 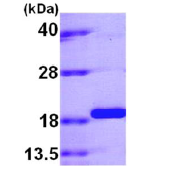 PPIL1 polyclonal antibody (A01), Lot # 060524JCS1. 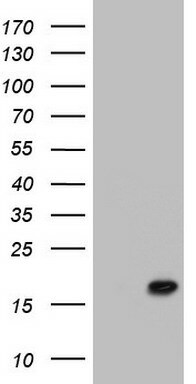 Western Blot analysis of PPIL1 expression in PC-12. Western blot analysis of PPIL1 (arrow) using PPIL1 Antibody (Center) Cat.-No AP53412PU-N. 293 cell lysates (2 ug/lane) either nontransfected (Lane 1) or transiently transfected (Lane 2) with the PPIL1 gene. HEK293T cells were transfected with the pCMV6-ENTRY control (Left lane) or pCMV6-ENTRY PPIL1 (RC200015, Right lane) cDNA for 48 hrs and lysed. Equivalent amounts of cell lysates (5 ug per lane) were separated by SDS-PAGE and immunoblotted with anti-PPIL1.